Do you think cats are immune to diseases? Well, if you do think so, you are not right. Though cats certainly have better immunity compared to dogs, they are not as safeguarded as you may think, especially from ticks. In fact, there is this one tick-borne disease in cats which is constantly on the rise in 17 states of the USA i.e. Cytauxzoonosis. What Is Cytauxzoonosis in cats and how is it caused? 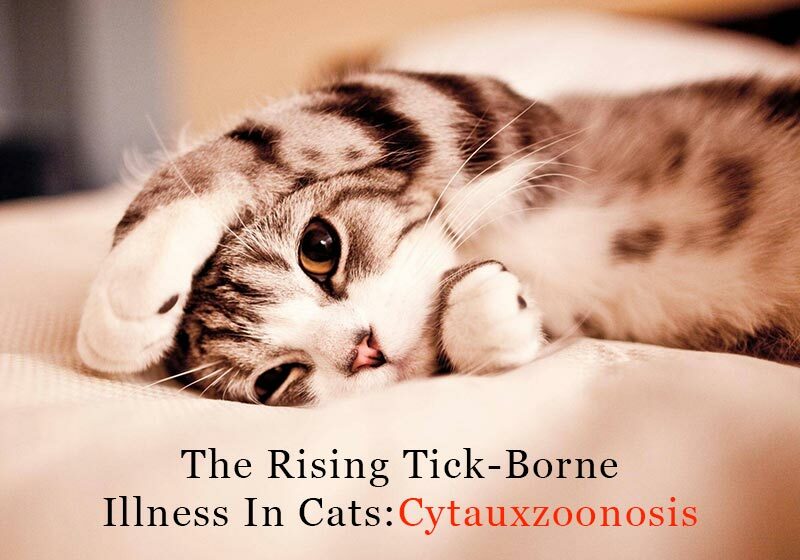 Cytauxzoonosis is a fatal vector-borne disease caused by ticks in cats. The disease was first reported in 1976 in the United States when a protozoa Cytauxzoon felis emerged as a blood cell infecting organism in cats. It was then that the researches figured out that the bite of an Amblyomma americanum (Lone star tick) caused the transfer of this protozoon into the felines. Studies also revealed that bobcats are the natural host of this organism and the disease can easily pass on to other cats through the ticks present on them. However, an infected cat cannot directly transfer the infection to another feline. For that, it needs tick to bite the other cat. Well, in the United States this infection is gradually expanding into almost all the regions including south-central, central, south-eastern as well as some mid regions of the Atlanta. Besides, weather and climatic changes are also one of the major reasons for its spread in other parts of the country. What are the symptoms of Cytauxzoonosis in cats? If at all your cat shows even the slightest signs of cytauxzoonosis, you must rush to the vet for her treatment. How Is Cytauxzoonosis Diagnosed in cats? A blood test can easily reveal the changes in blood cell and platelet counts. If there is any decrease in the number, it directly indicates the presence of infection in the blood. After ascertaining the presence of a foreign organism, a biochemistry test on a blood smear helps in revealing the presence of felis in the system. In the case of enlarged lymph nodes or selling in the liver or spleen, a biopsy is conducted to identify the organism. Other than this, PCR test can also help in diagnosing the parasite. What is the treatment for Cytauxzoonosis in cats? 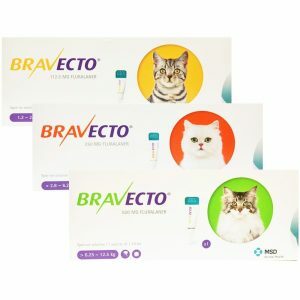 With the increased awareness and early detection, the disease can be treated with 60% chances of the infected cat to survive. However, the cat must be brought to the vet as soon as the symptoms show up. A vet may recommend hospitalization and treat the cat with intravenous drugs and injections. Well, it may take several weeks for the cat to recover if she survives through the infection. However, even after successful recovery, she may still test positive for the disease as the strain never really goes out of the body. In fact, the treated cat then becomes the carrier or reservoir of this disease. This is how vicious the disease is. Therefore, prevention is better than curing this disease. How You Can Prevent A Cat from Getting Infected? Cytauxzoonosis is caused by ticks so the best way to prevent this disease from happening in our cat is to administer tick preventatives to her. Tick preventative treatments help kill the existing ticks and further prevent their recurrence in the cat. Moreover, when these preventatives are taken year round, your cat stays protected from ticks no matter what season it is. Besides incorporating this tick control program, also try and keep the house as clean as possible and groom your cat regularly so she doesn’t ingest the tick while grooming herself. Check her bedding and wash it regularly. Vacuum your space at least weekly and keep the trash away from the house. Keep the yard shaved so the rodents, who are also the carriers of ticks, do not intrude in your surroundings. Cytauxzoonosis is a growing illness in cats and is strengthening its roots in the US. So, as a pet owner, it is your responsibility to make every possible effort to prevent all the risks that may lead to the development of this disease. Let the cats stay safe and disease free because if not now, the disease would have killed millions of cats by 2020. If you have a white colored dog then you know how frustrating it is when they get the tear stains. The dark red or brown colored stains beneath their eyelids can make their pristine fur look ugly and displeasing. Tear stains are usually not dangerous or painful but they need to be taken care of in order to maintain proper hygiene. 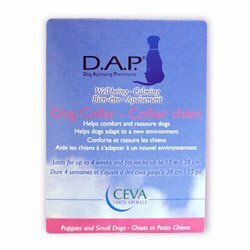 Good care will go a long way in preventing tear stains from occurring in your pooch in the near future. Tear stains are caused due to a condition called Epiphora which means excessive tear production. There are numerous reasons that could lead to tearing staining in your fuzzy friend. Porphyrin – In dogs, a pigment known as Porphyrin is primarily excreted through tears, saliva, and urine as well. They all contain substances known as Porphyrin which causes the stains in your pooch. Inverted eyelids – This condition is known as entropion and can lead to extreme tearing or drainage holes for tears in your pet. Genetics – Generally smaller or light colored dogs are at a higher risk of acquiring tear stains. Hair growth near the eyes – Some dog breeds develops massive hair growth near their eyes and this can lead to tear stains. 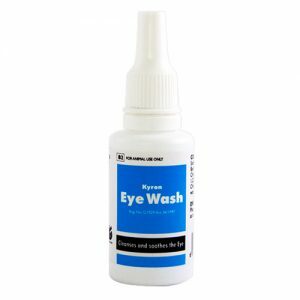 Infection or Scars – A skin infection or scar around the eyes can cause symptoms which may resemble tear stains. If the stain is brown in color then it is more likely to be caused by yeast instead of bacteria. Eye socket – Certain dogs have eye sockets that are shallow. If the sockets are not deep enough then it may find it hard to prevent tears from spilling onto the fur and areas near the eyes. Abnormal eyelashes – Some dogs may have abnormal or ingrown eyelashes that rub onto the skin and cause discomforts due to entropion (inverted eyelashes). This can cause the eyelids to produce more tears than normal. 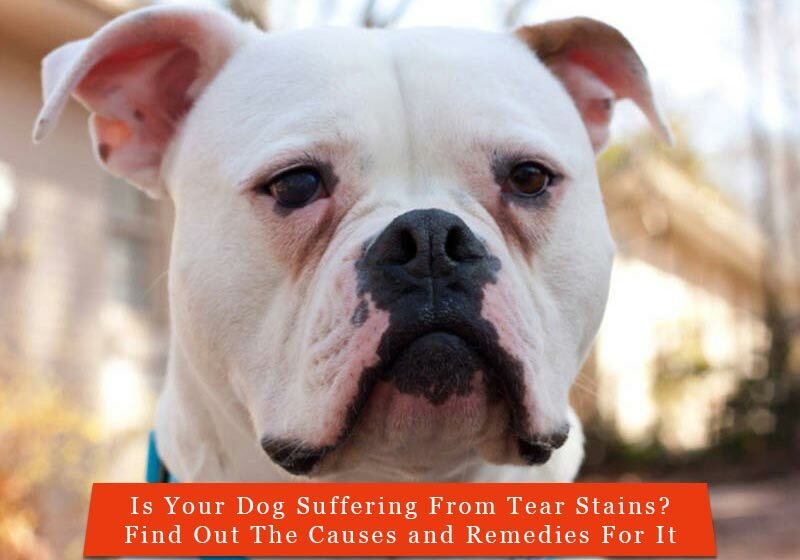 What are the remedies for preventing or treating tear stains in dogs? There are a number of remedies one can opt for preventing or treating tear stains. Here are a few common ways that might help you in preventing or treating tear stains in your Fido. Groom your dog on a regular basis. Ensure that the hair near the eyes is trimmed well. Examine the food you give your dog. 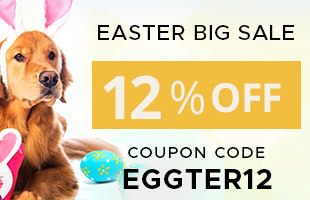 Good quality food will help to prevent allergies and also keep your pet healthy. Make sure the drinking water you give your pet is fresh and clean. Distilled, purified or reverse-osmosis water sources are highly recommended. Ensure that your pooch’s toys and bedding are cleaned from time to time. Adding food additives to your furry pal’s meals can help prevent stains and other problems. There are many food additives available and it may take you a little bit of experiencing to get to the correct food additive, so be patient. Adding a teaspoon of white vinegar to your dog’s water will increase the acidity of your furry pet’s body pH. Apply a solution of Hydrogen peroxide by simply dipping a piece of cotton in the solution and gently dabbing the stained areas. Herbal stain removers can be used to treat tear stains as well. When your pooch gets the tear stains, it is highly recommended that you visit a trusted vet in the first place. The vet will help you in detecting whether your furry pal has an eye infection or disease. In case no vet is available or if you believe it is an emergency, then you may opt for any of the above-mentioned points. Stay safe and keep your pet safe too. Young dogs exuberate tons of energy. They are always frivolous and elated and this vibrancy never seems to die out no matter what you do. These furry bundles of joy can even get up in the middle of the night and indulge in some mischief. However, sometimes, this attitude can be overwhelming to pet owners and may even land them in serious trouble. So, if you too have such a high spirited dog who doesn’t settle down easily, here are some tips that will help you tackle his over-the-top liveliness. Dogs are hyper when they don’t get to vent out their energy. On top of that, if they are young, they are more vivacious and robust, ready to conquer whatever comes their way. When this excess energy doesn’t get consumed properly, it counteracts as anxiety and restlessness. Therefore, make sure you take your young dog for a brisk walk regularly to tone down his spirits. Brisk walking will also give him a good exercise thereby keeping him fit and healthy. Obedience training is very much important to calm down the young nerves. It will teach them to stay patient and disciplined. Therefore, teach him commands like – ‘sit’, ‘leave’, ‘fetch’, ‘stay’. These commands can be very helpful in making him learn etiquettes. But, remember to reward him so he can associate good behavior with treats. Whether you like to play chase, fetch or Frisbee, just be on your toes around him. The more he plays, the more he will burn that extra energy. Let him run in the yard freely. But, amidst all these activities, do not forget to interact with him. Interaction during playtime helps in the mental development of the pup and brings emotional stability. 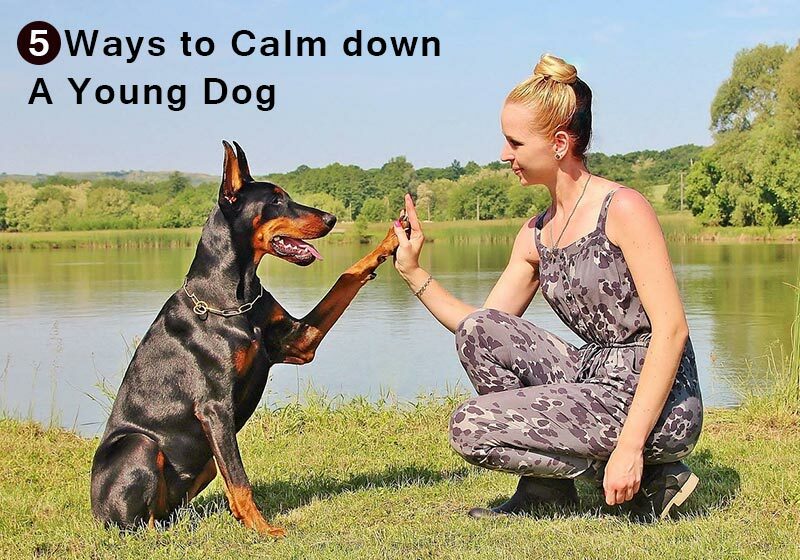 It is one of the most proven methods of calming a super-energetic dog. In these sessions, a dog is treated with essential oils like lavender and chamomile that give a calming effect to his mind and makes him subtle. So, if your young dog is one of the anxious kinds, give him some aromatherapy. Thundershirt is specifically developed for anxious dogs that cannot sit still even for a second. It is kind of a shirt, a gadget that when worn by the dog, he can calm down within an hour or so. Thundershirt contains chemicals and oils that diffuse into the skin and provide a relaxing effect which eventually settles the pooch down. Another, great and a very handy product is – diffuser. 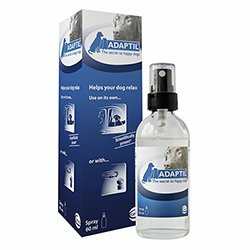 Diffuser again contains essential oils which gradually suffuse in the air and relax the pet’s mind. Keep the pet in a quiet room, switch the diffuser on and wait for the results. Young dogs are naive and they are completely dependent on us for their care and upbringing. Thus, to raise calm, mannered and an obedient dog which doesn’t go berserk every other moment, he must be trained in that way. Therefore, you must spend a lot of time with your dog when he is still young because early years are the ones when dogs are highly active and their minds are acceptable to learning things exactly as they are taught. Anxiety and over-excitement are common in young dogs but it needs to be aligned in the right direction which is possible only when you put efforts to nurture him well. Try these tips and you definitely will!